They sit within the darkness, waiting for the time to strike. They know what lies ahead. One after another they fall. They fight not for honor but for the sake of fighting untamed. The greed of power and the lust of victory fill the air. When all is quiet, they come out for their feast. Full of feathers not from fowl. Dancing With the Pen, edited by Dallas Woodburn, features the work of more than 60 young writers. She created a great organization: Write On! to give kids an outlet for expression, and to inspire youths to write and read more often. Everything in this book, mostly by junior high school students, is truly wonderful, but one other particular poem piqued my interest because waffle cones were involved. When I was a kid, two kinds of cones were available down at the corner candy store, the regular cone and the dark waffle cone, which was much better. The regular cone was a tasteless and airy nothing, just a delivery system for the ice cream; but you could eat the waffle cone alone they were so delicious. Most people ask for their choice of ice cream and get it served with the regular cone. If you want a waffle cone, you must specifically request it. I never know about the waffle cone until I hear someone saying “…on a waffle cone please”. Sorry that you can’t make a waffle cone on a regular waffle iron because the crevices are too deep, but if you have one designed for cones, you will probably use it often. I want to give you a recipe for waffle cones in case you have a special maker, and also an ice cream recipe that does NOT require an ice cream machine. Even if you cannot make the waffle cones, you can easily make the ice cream. An electric hand mixer can be used to break up the ice crystals during the freezing process. The mixture can also be hand beaten using a fork, whisk or a food processor. Using a non-custard recipe makes it very easy to make a delicious homemade ice cream. Following is a recipe for Cookies 'N' Cream ice cream that children and adults love. Crush cookies into small bite size pieces. Don’t pulverize them. Place the pieces in a bowl or measuring cup and set aside until needed. Pour the milk into a heavy saucepan. Over medium heat bring the milk to a gentle simmer (approximately 175°F) or until it begins to bubble around the edges. Then remove from the heat. After removing from the heat, add the sugar and salt to the scalded milk. Stir the scalded milk until sugar and salt are completely dissolved. Caution, the liquid is hot. Speed the cooling process by placing the bowl in an ice water bath. Chill the ice cream mixture. When the mixture has cooled, cover it with plastic wrap and allow the mixture to set in the refrigerator for at least 4 hours or up to 24 hours. This aging process will give the mixture better whip-ability and produce an ice cream with more body and a smoother texture. A kitchen timer is useful here. After chilling, remove from the refrigerator and stir the mixture. The ice cream is now ready for the freezing process. Transfer the ice cream mixture to a freezer safe bowl or container if not already in one. Cover tightly with plastic wrap, foil or an airtight cover and place the container in the freezer and allow the mixture to freeze for 2 hours. Use the timer so you can attend to other things meantime. Remove from the freezer and beat with an electric hand mixer to break up ice crystals that are beginning to form. Cover and place back in the freezer. Freeze for 2 more hours. Then remove from the freezer and beat once again with the hand mixer. The ice cream should be thick but too soft to scoop. If it is still not quite thick-ish, return it to the freezer for additional freezing time. Beat again before adding cookie chunks. 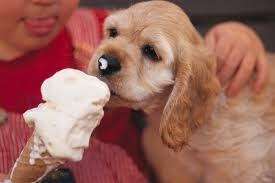 When ice cream has thickened properly, stir in the cookie chunks until well distributed throughout the ice cream. Do not beat with the hand mixer after the cookie chunks have been added, because that would break the cookies into crumbs and tiny pieces, which is not visually appealing. Pour into a plastic airtight freezer container. Pack the ice cream in the container. Be sure to leave at least 1/2-inch headspace for freeze expansion. After the ice cream has hardened sufficiently, take the ice cream container out of the freezer, remove the cover and scoop ice cream into bowls or those fabulous waffle cones. Eat with pride my friend, a pride shared through the years by ice cream makers everywhere. 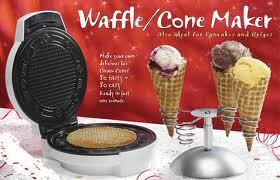 Preheat the waffle cone iron according to directions. Beat in the sugar and beat until the sugar is incorporated and the egg has lightened in color slightly, about 1 minute. Add flour and beat another 15 seconds or until incorporated and all lumps are gone. Add the melted butter and stir until well blended. Spoon a little batter in the center of the iron. Bake for 1 minute then check for proper colour. Cook a few more seconds if necessary. Quickly remove the waffle from the waffle maker onto a clean cloth towel. Work rapidly, but if the waffle is too hot to handle with your bare hands, use the cloth to help lift and roll the waffle around the cone form. Hold the cone a few seconds to set its shape then place on a wire rack to cool. Your own ice cream will always taste better, because you are controlling the groceries, and if you remember those waffle cones from days of yore, the nostalgia will add to the fun. Enjoy. I do love ice cream but I'll have to settle for store-bought. I signed up for my first A-Z Blogging Challenge, #472, and saw your blog listed so I just stopped by to say "Hi". I look forward to reading your "alphabet" posts in April.